Switzerland stamps showcase one of the most significant countries in Central Europe. Their stamps depict the centuries of historical events, the famous people, and the stunning Alpine scenery of this tiny little European country, that has become a beacon of "peace" for the world. Another remarkable thing about Switzerland is their accomplishment in having been able to avoid participation in any armed military conflict for about 500 years now! Switzerland became a beacon of liberty during the 20th Century by maintaining its neutrality and sovereignty through two devastating World Wars. It's not surprising that a large number of international organizations and international peace conferences have all been based in Switzerland over the centuries. The first Swiss stamps were those of the Cantons (States) of Zurich, Geneva, and Basel. These early Swiss stamps have another distinction. They were also the 3rd (1843), 4th (1843), and 5th (1845) adhesive postage stamp issuing nations of the World! Unfortunately, the Cantonal postage stamp issues are tremendously rare today, and nice examples are far beyond the financial means of most stamp collectors. In 1848, all the Swiss Cantons joined together to form the Federation of Switzerland. The first postage stamps for the Federation of Switzerland were issued in 1850. All of these Switzerland stamps bore the Switzerland Coat of Arms. An example is shown above. For the philatelist, the early postage stamp issues of Federation of Switzerland offer an abundance of specialization opportunities, with some definitive issues featuring many different printings, papers, types, plate flaws, etc. Myself, I collect the entire country, but I specialize in the Strubels and in the Standing Helvetia series, as much as my present retirement budget will allow. 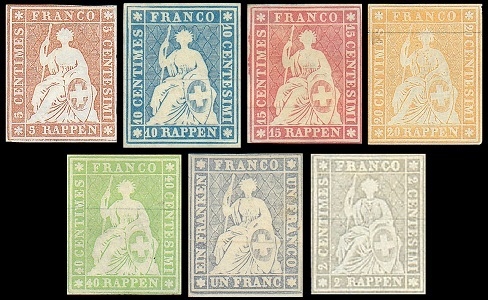 For the person that has a country collecting approach and avoids the prohibitively expensive Cantonal issues, most of the major postage stamp issues, from the first postage stamps of the Swiss Federation to those of today, are actually just about completable, requiring only a moderate long-term investment. Today, that can not be said for most of the countries of the World, especially those that have been issuing postage stamps since the middle of the 19th Century. If one isn't particular about having an occasional repaired classic stamp in their collection, even some of the Cantonal issues are reasonably attainable by the dedicated philatelist with a substantial budget. It was easy for me to get hooked on collecting this country. Knowing that my family's origins were originally Germanic, I have always had an interest in the history and postage stamps of the German speaking countries of Europe. But, a few years ago, I was working on my family's genealogy and discovered that my Great Great Grandfather came to America from Switzerland around 1870. In doing further research, I actually found that the Aeschlimann name (or variants of it) originated in the area of the Bern Canton of Switzerland in the early 16th Century. So, besides my philatelic interests in the country, I have a family connection to it, as well. Reviews of the postage stamp issues of Switzerland, as well as occasional historical articles, will eventually appear in the page link section at the upper right. All of the content pages in this Switzerland stamps category are presented, as chronologically as possible, by a combination of the Zumstein Schweiz Liechtenstein 2010 catalog and the Michel Schweiz / Liechtenstein-Spezial 2008 catalog. Souvenir sheets and special issues that show regular postage stamps or that are companion issues to regular definitive and commemorative postage stamps will be listed chronologically in either the "Definitive" or "Commemorative" link pages. Souvenir sheets and special issues that show surtaxed postage stamps or that are companion issues to surtaxed postage stamps will be listed chronologically in either the "Pro Patria" or "Pro Juventute" link pages. I have received a substantial number of contact-form requests in the last couple years, asking that I assist in determining what the Scott Standard Postage Stamp Catalog numbers are for various classical Switzerland stamp issues. As a result, in the very near future, I will be adding Scott catalog number cross-references, where possible, to catalog attributes tables containing only Zumstein catalog numbers.